I'm going to be honest here guys, I don't own house plants for a very good reason. I'm sure I'm not alone here but they just die on me! I talk to them and water them (when I remember) yet they would rather die than live with me!! So whilst at the garden centre this weekend I thought I'd try growing some cacti - surely I can't kill these off eh? Saying that a couple of them already look a bit dodgy, so I'm not taking that ownership on if those 2 die! I wanted to originally plant these in seashells but let's face it, these are spiky little suckers and there is no way I was going to fiddle around trying to plant these inside little holes whilst they're trying to kill me! 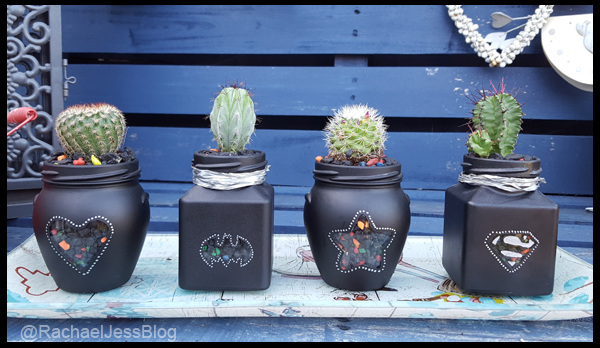 For little succulent plants, I've found small tins such as tuna, sweetcorn and baked beans make ideal containers. 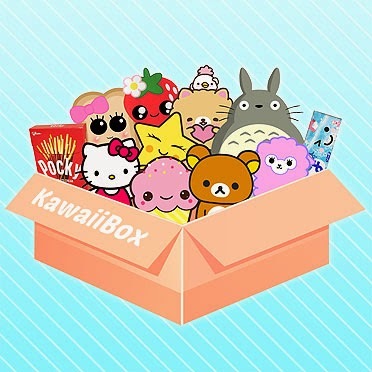 I'm often redecorating my food containers and repurposing them. 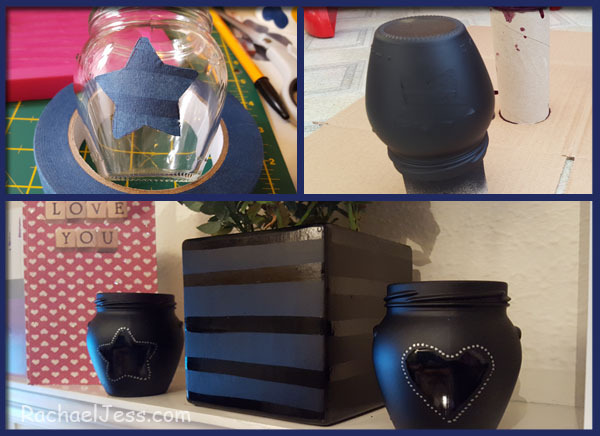 This is such a quick and easy way to transform junk into style to match your home decor. Glass jars also make lovely containers and possibly my favourite. 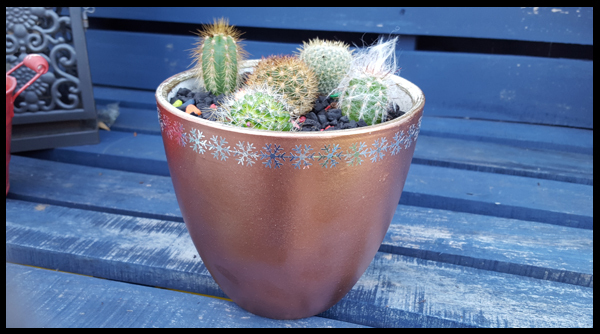 You can leave the jars clear with the plant inside, but as I mentioned earlier, that can be a prickly job if you've got cactus to plant! 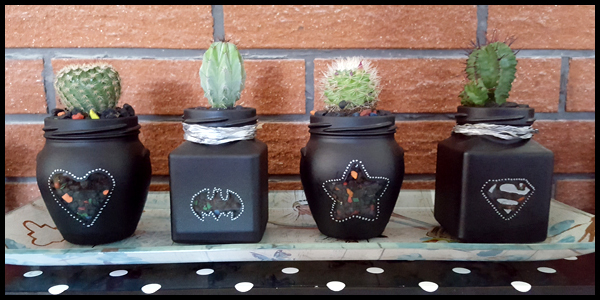 Or, you can decorate the jar itself as I have done, and have the cactus sitting on the top. I had quite a few plants so rather than having 9 small pots all around the house I decided to use one of my charity finds. 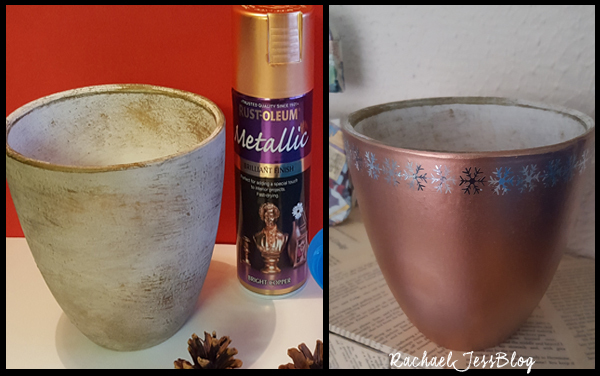 Earlier on in the year I'd picked up a 50p plant pot and sprayed it metallic with some Frozen snowflakes around the top. So now I have 9 little cactus plants dotted around the house, lets see if I can keep these guys alive. Oh well done :) My cactus are still going strong.... I think.